I’m sure you realize the library is one of my favorite places. There’s no place else that lets you read as many books as you want for FREE! 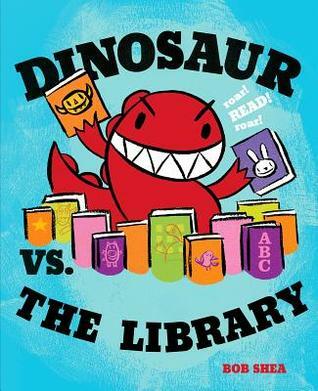 And, bonus: picture book characters often spend time in the library! Here are a few selections to choose from. The bats are bored until someone finds an open window at the library. Some swoop off to the bookshelves while others hang out under a lamp to talk about the books they’ve read. Some bats play with the overhead projector or the copy machine. Others explore the pop-up books. 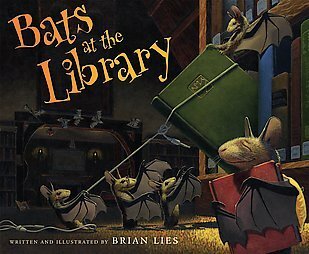 And of course, there are bats hanging upside down under a table reading adventure books upside down and imagining that they were on the same adventures. But when light comes in through the window, the bats know their ‘bookish feast’ is drawing to an end. The leave quickly hoping for the next time the librarian leaves the window open. One day a lion walked into the library. Since there were no rules about lions in the library, and he didn’t seem to be causing any trouble, he was allowed to stay. The lion explored, fell asleep in the children’s corner, and listened during story hour. When he roared, he was told to keep quiet or leave. The next day he returned, and the next, and the next after that. Miss Merriweather, the librarian gave him small jobs to keep him busy until story hour every day. He dusted the encyclopedias with his tale, licked all the envelopes for overdue notices, and carried small children on his back so they could reach the top shelves. And every day he curled up in the children’s corner and waited for story hour to begin. Then one day, Miss Merriweather fell trying to reach a book off the top shelf. She called for help but no body heard her, so she asked the lion to go get help. The lion ran to Mr. McBee’s desk. Mr. McBee ignored the lion, until he Rrroooaaarrreeeddd! Mr. McBee demanded that the lion leave the library and then marched himself right to Miss Merriweather’s desk to complain when he noticed her on the floor. Mr. McBee called a doctor and Miss Merriweather had her broken arm fixed, but the lion was nowhere around. He didn’t return for many days, and everyone missed him. Mr. McBee felt so bad that he walked around the neighborhood looking for the lion. He finally found the lion and explained the new rule: There is no roaring in the library unless you are trying to help a friend who is hurt. 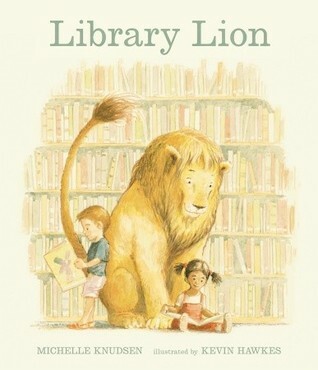 The next day, the lion returned to the library and everyone was happy!